Anyone who’s been following my writing for any period of time knows I’m a proponent of starting with a 40 card land base in Commander. My argument is relatively simple and has two basic points: first, 40 cards is to 100 as 24 is to 60, and 24 is the baseline for most 60 card decks; second, it’s better to be flooded and be able to cast spells than to be screwed and not do anything. The single most common piece of advice I give to people when asked for help about building or fixing a Commander deck is upping the amount of land and/or mana sources. It kind of feels like I’m fighting an uphill battle, though, because I see decks all the time which rock 35 lands (and often don’t have the mana to cast their spells). I understand the drive to run fewer lands. We’re limited to a specific size in this format, and there are a lot of really fun cards to play, so if we just cut a land or two we can run that awesome 7-mana enchantment or squeeze in one more Wrath effect. I get it. And most of us understand the problem. If we include a 7-mana spell in place of a land, we’re that much less likely to draw the mana we need and won’t be able to play that 7-mana spell before the game is over. We can add extra mana sources to our decks, like ramping (Cultivate or Oracle of Mul Daya) or mana rocks (Orzhov Signet or Hedron Archive). This only accelerates how quickly we get out our mana sources, though; it doesn’t change how much mana we need to play our spells. A deck with a bunch of top-end, expensive spells still needs plenty of mana to play them. A deck with mostly cheap spells needs fewer mana sources. Compare this to traditional 60-card decks: expert deck-builders start with 24 lands and adjust up or down depending on curve. A cheap, aggressive Mono-Red deck can drop to as few as 20 (or even 18) mana sources because the deck can win with two lands on the battlefield. A powerful, late-game Azorius ( ) deck might run as many as 27 or 28 mana sources, because it needs to be able to cast a kill spell and a counterspell effect the same turn it plays out an enchantment to lock down an opponent’s land. It also may play a large X spell like Sphinx's Revelation and want a ton of mana for it. A deck like that in Commander wants about 48 mana sources — that’s almost half the deck! But a cheap deck clearly needs fewer mana sources. 20 lands in a 60-card deck is 33 in a 100 card; 18 is just about 30 lands. As long as we’re playing with restrictions, how about building a deck at the low end of the curve so we can pack more action and fewer lands into the pile? We’ve only got 30 lands here, with no ramp of any kind. We’ve got some lands which do stuff, like Arcane Lighthouse to light up our opponent’s hidden stuff, and Crypt of Agadeem, which is a fun way to get extra mana late game, when we actually might want to use it. Cycling lands give us an extra card if we don’t need to land drop that turn, and a suite of land-destruction cards help with troublesome things like Rogue's Passage or Tolarian Academy. Otherwise, Swamps do the job. Dark Ritual is normally not worth it in Commander, but here it can lead to such an explosive first turn it’s worth it. Beseech the Queen is our only tutor, and it’s one of the “fair” ones because we have to reveal the card we get. Plus, we’re not rocking any combos here, a frequent objection to tutors. 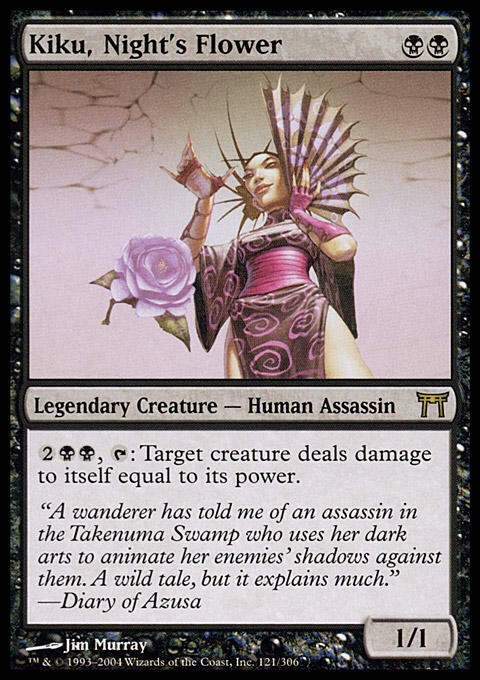 Praetor's Grasp tutors one of our opponents, and since we’re Mono-Black we can normally only grab an artifact anyway. Solemn Simulacrum might be a good choice, though Akroma's Memorial or Argentum Armor would be fun too. Phyrexian Arena should probably be in every Black deck in existence, and Sign in Blood and its ilk are great ways to keep the hand full. Succumb to Temptation is worth the extra mana, because we can do it just before starting our turn with excess mana. We’re limited in threats. We’ve got a bunch of little dudes, and mostly we’re looking for useful abilities like killing a creature or . . . well, killing a creature. Several of our creatures kill a creature in some way or another, and most of those that don’t have Deathtouch to serve as rattlesnakes for our opponents. Our commander, of course, helps us keep the board clear of many threats; it’ll kill the majority of creatures we encounter. We’ll struggle with Doran, the Siege Tower decks, but most of the time she’ll be pretty effective. Our biggest threats come from a couple of specific places. 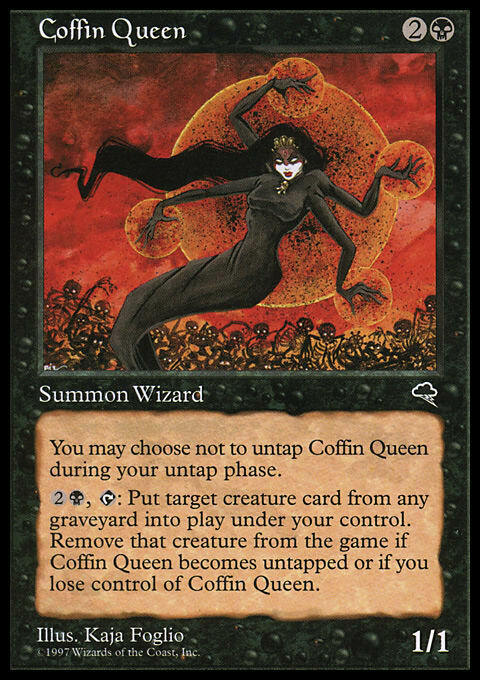 Nezumi Graverobber can flip and give us access to dead things our opponents have in their ‘yards, and Coffin Queen can just straight-up steal something. Sometimes we can use that to grab something which can end the game — imagine stealing someone’s Sun Titan with this deck. We’ve also got Exsanguinate and Torment of Hailfire, which can end games pretty effectively if we can survive long enough. We have a sheer ton of kill spells. Doom Blade and Hero's Downfall are the classic death bringers, and Fleshbag Marauder and Oath of Liliana (which is just another Marauder in this deck — with only one Planeswalker, the second ability will barely matter) get around unpleasant things like Hexproof and Indestructibility. Tragic Slip and Sudden Death are each special in their own ways, and Sudden Spoiling can really spoil someone’s attack. Black Sun's Zenith, Bontu's Last Reckoning, and Killing Wave are our kill-everything effects; with spells limited to three CMC we’re fairly limited for big effects like that, but at least we’ve got some options. And we shouldn’t be afraid to use our Deathtouchers a lot — make your enemies pay for attacking. Bloodchief Ascension is a fun card here; we don’t have to do the 2 damage to get its quest counters, and the damage can start adding up pretty quickly when it’s online. We’ve got a bunch of funny equipment which do different things, too. Rogue's Gloves is great on a creature with Deathtouch, of course, but so is Neurok Hoversail (can’t fly over me!) and things like Cathar's Shield, so it might actually survive the encounter. Hot Soup can help us punch a little damage through, which is great if we stick a Darksteel Axe on something because we might be able to get in enough to matter. Bloodforged Battle-Axe can be helpful here, because we can make a whole bunch of Battle-Axes with unblockable creatures. Profane Command deserves special notice here, because that card does a lot of things. Late game, it can clear a nasty creature, straight-up kill an opponent, or let a pack of our creatures get right through someone’s defenses. One problem with a deck like this for Convertible Commander, though, is we can’t add a bunch of stuff with high CMCs in our optionboard because of the mana base, so the pickings are already pretty thin. However, one thing we can do will make our deck a bit more . . . mean. 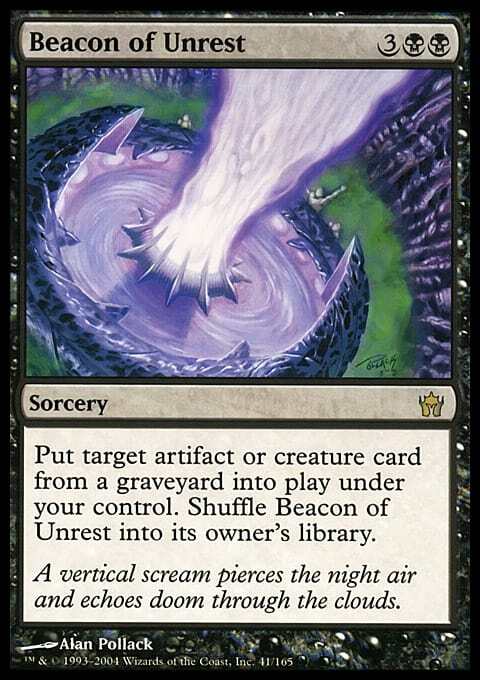 We add a couple more graveyard-recursion abilities here, specifically Reanimate, Beacon of Unrest, Necromantic Summons, and Endless Obedience. 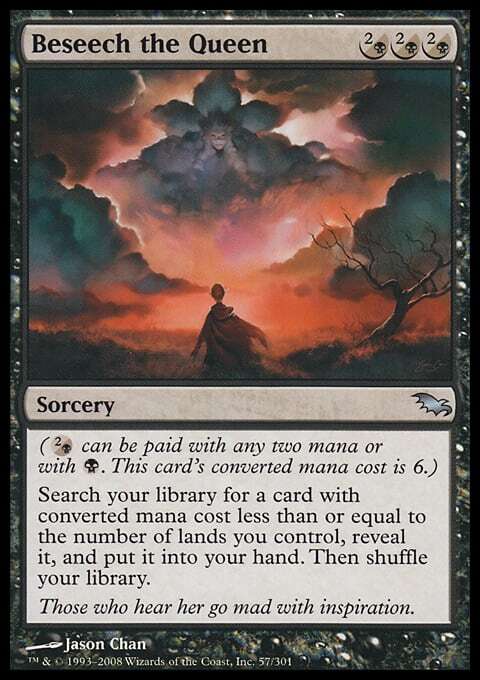 Reanimate is in our mana price range, Beacon and the Summons are both 5-drops (so a little pricey and breaking our restriction), and Endless Obedience is 6 though we can use Convoke to bring the price down. But the big thing we do is attack our opponents’ hands with some discard. Many of our new cards are creatures which cause a discard when they enter or die, plus we get the silly Shrine of Limitless Power and the nasty Delirium Skeins. The idea here is to add in a discard subtheme and hopefully hit one fairly early. If we do, maybe one of our opponents will discard something big because they can’t play it for a while and they don’t want to discard the stuff they can actually play. Then we can eventually reanimate it to smash them in the face with it. It paints a bit of a target on us, but makes the deck play quite differently and forces everyone to work around the fact that at any moment we might make them discard something. I considered Desolation for a long time. It’s really, really mean, though, especially for someone playing, like, Kemba, Kha Regent. Weigh the cost/benefit carefully based on your playgroup. Yawgmoth's Will could be interesting, too, but it’s so darned expensive it didn’t seem worth the ability in this deck, where we’re not going for a combo, just getting back some kill spells and goofy creatures. If you have one kicking around or feel like spending the dough, it’s a card worth having in your collection. Mana cost is an interesting way to restrict the card pool of the deck we’re building; we have to figure out how to deal with the broad spectrum of threats we’re going to see at any given Commander table. Have you ever restricted yourself like this? If so, how did it go? And what did I miss in this deck? Please sound off in the comments!